If there is a taste of terroir in Pinot Noir, it's disappearing every year. Ironically, one expert says that's because winemakers are getting ... in a technical sense ... better. 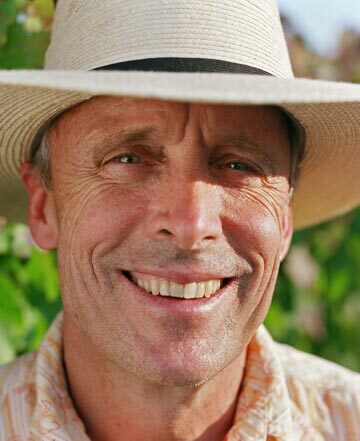 Larry Brooks, winemaker at Tolosa in Edna Valley and a popular consultant, was kind enough to send me a transcript of his keynote speech for the Southern Pinot Noir Workshop in New Zealand in January. Brooks, who made wine at Acacia from 1979 to 1998, has about as much experience with Pinot as anyone outside of Burgundy. * A German study showed that there is much more correlation between soil type and aroma than between soil and flavor; in other words, you can smell terroir more than you can taste it. This has been backed up by studies in both France and California. * Winemaking decisions can easily overpower terroir. This is intuitive: use new oak, or let the grapes get very ripe, and it's hard to tell where the wine is from, or even what grape(s) it's made of. * Color and aroma are inversely related: Light-colored Pinots tend to be more aromatic, while more color means less perfume in the aroma. * Pinots are getting darker, in part because they can -- viticultural research has helped here -- and in part because they score and/or sell well. * Side point: Brooks added by email that when a wine is added to Pinot Noir to bulk it up, it's usually Petite Sirah, not Syrah, because "Syrah has too much flavor of its own to be a good color blender." He says that this happens mostly in cheaper Pinots, not the expensive single-vineyard ones. * His conclusion is an irony: better winemaking is leading to less noticeable impact of terroir. This makes sense if you think about it: if you really want to taste the impact of terroir, you put the grapes in a cement tank and leave them alone. Once you take the first step to improve the wine -- oak, cool fermentation, whatever -- you are changing what nature would do on its own. This isn't a value judgment, especially as nature on its own might prefer to make vinegar. It's just a statement of fact. Brooks by email: "I detest the term 'natural' in the context of wine. All wine is artificial in the best sense of the term. It is a product of artifice. The winemaker is a artificer or craftsman if you will." I'm sure it wouldn't be popular in Burgundy, where everyone keeps a map of their soil type close at hand, and where vintners celebrate vintages like 2009 where they can easily extract sufficient color. But science is science. As long as the marketplace rewards darker red wines, terroir will continue to fade into the background, even in our beloved Pinot Noir. So how do phenols and tannins correlate with alcohol levels? I'd argue that only through over under* analysis of alcohol % could you truly say that "exactly the same thing" is happening in France as in the US of A. * yes, this was in part (ok, mostly) to answer the writer geek challenge (however poorly), but it does seem that there's been a sharp rise in alcohol levels (and maybe this is the same as phenols, but I'd guess there's a difference there somewhere) on this side of the pond (and particularly on the southern side of the CA/OR border, but I wouldn't be surprised to learn that OR is tracking CA in this kind of heat). If you go to the Willamette Valley, there sure are a lot of tasting rooms that sell both a really dark Pinot Noir and a Syrah. What conclusion should be drawn? Dave: It's a fair question, and one I don't have the stats at hand to answer. I wonder if somebody out there does. Alcohol level gets written about all the time, though: these other stats aren't talked about as much, but are probably more important for the way we perceive a wine's taste. Anonymous: I think Larry answered that question in his speech. Parallel winemaking. Ummm... I understand his conclusion that "winemaking" is leading to weaker terroir expression, but why exactly are we assuming this kind of winemaking is "better"? The frayed relationship between terroir and Pinot Noir is largely due to fruit sourced from newer poorly selected vineyard sites growing overcropped, overripe fruit resulting in high alcohol wines that lack distinction. This is also why the wines are bigger and darker—higher alcohol levels lead to more extraction of tannin and phenols. Being too heavy handed in the cellar with extraction or barrel selection can diminish terroir as well, but it has to be there in the first place. How much terroir can one find in 7-year-old vines? Blending further muddies the terroir. Blending Pinot Noir with Pinot Noir, even from the same AVA (sometimes from the same vineyard), can compromise flavor. This is why single vineyard or single block Pinot Noirs have gained such prominence in the last decade. Add another varietal into the mix, and the Pinot Noir disappears entirely. Is all this the result of better winemaking? Perhaps, but intervention can often strip a wine of its terroir, which can only come from the vineyard. "Reviews drive sales, sales dictate style. Just ask Enologix." Right, there's an unbiased opinion. But speaking of confusion and terroir, how about the role of clones? Willakenzie bottles different clones from very similar terroirs, and the wines are noticeably different. Or winemaking technique - Dujac vs. Leroy; is one or the other muddying terroir or are both expressing it, just in different ways? Alas, I don't have the budget to execute the necessary research. Why pick out Pinot specifically? This modern winemaking style cuts across all varietals. And only people who aren't that concerned with this debate or who are lazy would bring up the old "all these pinots taste the same" comments. Just like in Burgundy you have to really get to know different areas and producers to be able to see the broad variability. I make Pinots in California and all of my wines are very much representative of their individual vineyards or regions. I can name 50 other producers who can claim the same. Sure I can also name many who couldn't say that, but that is true of all wines. Here is a suggestion- go to the Anderson Valley Pinot Festival and check it out. Learn the area and the producers and you will see what great work is being done. Then go to Pinot Days and sit in a region specific seminar with multiple bottlings. After that I'll give you more suggestions. Maybe you have to kiss some frogs before you find your Prince, but they are out there and you can find them. Kim: Your points are valid, and yet the same issue affects single-vineyard Pinots even from the best areas. Mike: "Better" is a loaded word, but I'm not going to back off of it, because in this case it means "technologically more competent." I don't see Coca-Cola as an analogy because sugar is not unique to Mexico, though wow, are sodas with sugar tastier than those with high-fructose corn syrup. Christian: I personally don't believe clonal selection is part of terroir for exactly the reason you describe. It may be considered that way in parts of Europe, but here in the US of A we plant whatever we damn please, so that means every vine is a judgment call. Hi, interesting point of view. I have heard from CP, our wine maker, that good wine can be made from 'bad' grapes but it is hard work. Great wine is made from great grapes. So maybe Terroir is still important for the great grapes factor? Sorry if that is a silly question, like I have said in the past the wine industry is new to me and I'm learning as I go, which is one of the reasons I follow your blog! Mountford: I think Larry's point rests in how one defines "great grapes." A viticulturist would strive for perfect, even ripeness -- and that might help diminish what we think of as the aroma of terroir. Re: writer-geek challenge. I owe this to Abbott and Costello. Go ahead, back up!